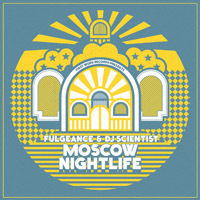 As announced earlier this year, “Moscow Nightlife“, the first single from Fulgeance & DJ Scientist‘s new project “The Soviet Tape Vol. 1“, is ready and available for pre-order via First Word Records as well as the Equinox Online Store. On the full length album, you can expect more fire from Fulgeance and DJ Scientists‘ beat arsenal as well as some dope features by the likes of Blu, Open Mike Eagle, Distant Starr and more! Stay tuned for “The Soviet Tape“! It has been a while since our last issue but we will try to keep this as short as possible. About a year ago, Equinox founder, DJ Scientist was filmed diggin’ records in Berlin for Diggin Is A Science. A few weeks ago, it was finally published on YouTube! More importantly, his new project together with Fulgeance is about to be released this year in form of a single and full length album. DJ Scientist dug out a haul of rare samples for the French MPC virtuoso Fulgeance (one half of Souleance) who transformed the source material into one of the most exciting beat maker projects this year: ‘The Soviet Tape‘. A first single, ‘Moscow Nightlife‘, will be released in late September / early october on First Word Records from the UK and is aimed squarely at the DJs and the diggers with three dope instrumental Hip-Hop tracks. On the album, you can expect more fire from Fulgeance and DJ Scientist’s beat arsenal as well as some dope features by the likes of Blu, Open Mike Eagle, Distant Starr and more! Next up, we’ve got a fantastic new video of 2econd class citizen performing “Here Comes The Sun“! Follow the link bellow for the review, where you can also find links for online streaming and/or purchasing both, vinyl and digital versions of the release. Finally, we’d like to close this issue with a smooth and mellow Equinox Records tribute radio show by DJ Slow Pete, where he plays a few of his favorite tunes including music by DiViNCi, DJ Scientist, Emynd, 2econd class citizen, Deckard and many others. That’s it for now. As always, thanks for reading and if we’ve missed anything that should have been included, please send it in and we’ll include it on our next issue. 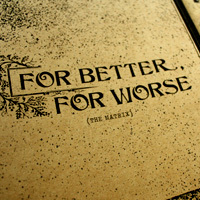 DJ Scientist – For Better, For Worse Matrix Edition Out Now! Finally…. it’s done!! The first official and complete list of sound sources for a 100% sample based album is now available for purchase! A beautiful product in form of a 64-page book/booklet designed by DJ Scientist himself aka The Raincoatman. It contains a complete list of samples used for Scientist’s album “For Better, For Worse”, including samples used for the artwork. There are multiple graphs and statistics regarding sample sources, genres, etc.. Plus extensive track notes with album art and statistics. Only 30 booklets made. All of them hand numbered! Possibly one of the most crazy projects in the history of sampling, so we hope you dig it! You can purchase it now at the Equinox Online Store: SOLD OUT! Godblesscomputers: New EP “Veleno” Out Now! Godblesscomputers has a brand new release out – and it’s a great one! Please check out his new EP “Veleno” via White Forest Records / Fresh Yo! which is available now as a very limited vinyl edition as well as digitally. Here is the first major announcement for the Equinox Online Store clearance sale! The sale will start NEXT TUESDAY, January 7th (which means that there is a slight delay, as we originally wanted to start today). So yeah… mark the day in your calendar! We are sure that there will be some great stuff that you can add to your collection. 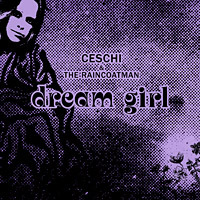 As a special New Year’s Eve release, Ceschi & The Raincoatman are offering a free single with two unreleased songs. 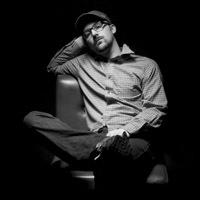 The main track “Dream Girl” has been recorded during the “The One Man Band Broke Up” period and is based on a smooth psychedelic beat produced by DJ Scientist a.k.a. The Raincoatman. The lyrics were inspired by a rare Neutral Milk Hotel song. Another track that is yet unknown to most fans, “Wildflower”, is backing the release. The song has only been available on the “A Re/Introspective 2011/12” CD that came along with a special calendar in late 2011. Additionally, if you are a vinyl lover, please note that the first limited pressing on white vinyl of “The One Man Band Broke Up” is almost sold out (1000 copies were made). There is a very limited reissue available soon of only 275 copies on black vinyl that includes a brand new “Free Ceschi” poster. Furthermore, due to popular demand, a song called “Hello N.Y.” which was only released on a very limited vinyl postcard set will be made available for streaming on the release date of the LP reissue. This song has originally been written for the “The One Man Band Broke Up” album but then was replaced by the song “No New York”. 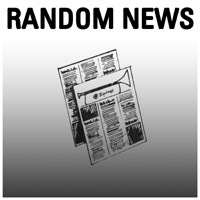 Welcome to Random News #12! A lot has happened since our past issue. Some of our former artists have been really active and there is brand new music out now or coming soon. Moving on to 2econd Class Citizen who is working on a BIG new album at the time. but be on the lookout ’cause things are about to heat up soon. Next, we’d like to share the video for David Vangel‘s “Back in the day” track, from his latest EP, “BNAPTH“. Furthermore, we’d like to share two videos of the Deviated Theatre‘s “creature” an original dance opera for the digital age show, that feature tracks from the Equinox Records catalog. OOOOOhhh-Kayyy… That’s it for now. We’d like to thank you all for taking the time to read this issue! Although we still have a New Year’s Eve present for you earlier (see here: Free Single by Ceschi & The Raincoatman) we already want to wish you all the best for 2014! And, as always, if we’ve missed anything that should have been included, please send it in and we’ll include it on our next issue. Good news for all Ceschi fans: New Year’s Eve 2013 will see the release of free single by Ceschi & The Raincoatman which will be available on December 31st at 1 pm (CET) via their new bandcamp page. 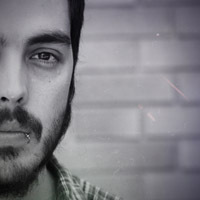 The main track “Dream Girl” has been recorded during the “The One Man Band Broke Up” period and is based on a stunning psychedelic beat produced by DJ Scientist a.k.a. The Raincoatman. Another great song, “Wildflower”, is backing the release which also should be unknown to most fans. The track has only been available on the rare “A Re/Introspective 2011/12” CD that came along with a special calendar in late 2011. Furthermore, due to popular demand, a song called “Hello N.Y.” which was only released on a very limited vinyl postcard set will be made available for streaming on the release date of the LP reissue (more info soon). This song has originally been written for the “The One Man Band Broke Up” album but then was replaced by the song “No New York”. Since today, December 13th, a couple of albums and singles are available digitally for the first time via all common download stores and also for streaming via Spotify and alike. Below are some of the direct links, but you should be able to buy this in almost any digital store you want. We are quite sure, that there may be something you have missed from these releases or something you might want to listen to again. So check it out! Audiac has been the former sublabel of Equinox Records and we put out a couple of vinyls, CDs and well as Hip-Hop mixes on that imprint. All these releases are now available on Bandcamp as well as Mixcloud. 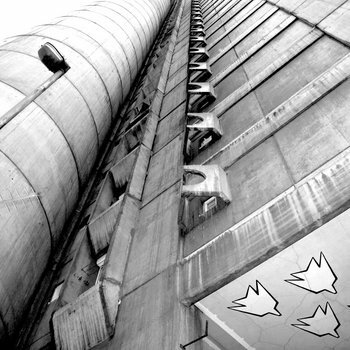 Amongst albums by Misanthrop, the instrumental EP by Misanthrop & Aqua Luminus III., and a release by Asup, the Misantropolis EP by Ground Zero, which came out in 2002, is available in digital format for the first time. This EP was the very first release from our company and even was produced earlier than the first 12″ on Equinox. 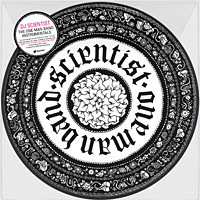 DJ Scientist and Backdraft, who formed the backbone of the crew, are the main producers on the EP which is based on raw instrumentals, turntablism and also rap. Among others, “Take Over” features cuts by Robbie Bubble (aka German DMC Champion DJ M-Tech) and “Bergkristall” features vocals by Omega Takeshi (of 88:Komaflash), whereas the intro song “Devotion” has been produced by Misanthrop. We think that it is save to say that Misantropolis is one of the first German “Abstract Hip-Hop” and Turntablism releases and remains a classic in its own right. Furthermore, we released a couple of mixtapes between 2004 and 2007 by DJ Scientist, DJ Arok, Phonatic and the Dedicated Beatheads – all of them are now available via Mixcloud for streaming. So check them out and repost if you like them! Audiac has been the former sublabel of Equinox Records and we put out a couple of vinyls, CDs and well as Hip-Hop mixes on that imprint. All releases are now available on Bandcamp as well as Mixcloud. For the first time ever, the Misantropolis EP, which came out in 2002, is officially available in digital format. This EP was the very first release from our company and even was produced earlier than the first 12” on Equinox. We think that it is save to say that Misantropolis is one of the first German “Abstract Hip-Hop” and Turntablism releases and remains a classic in its own right. 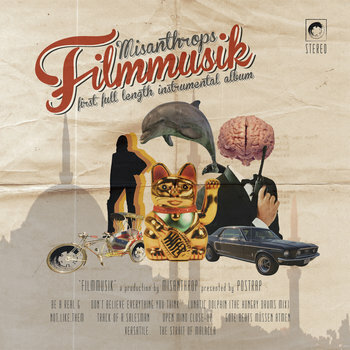 DJ Scientist and Backdraft, who formed the backbone of the crew, are the main producers on Misantropolis which is based on raw instrumentals, turntablism and also rap. Among others, “Take Over” features cuts by Robbie Bubble (aka German DMC Champion DJ M-Tech) and “Bergkristall” features vocals by Omega Takeshi (of 88:Komaflash), whereas the intro song “Devotion” has been produced by Misanthrop. 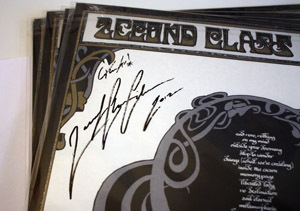 The original version of the EP, which has been released on a limited 12” vinyl, had another vocal track and had a different track listing. This revised version also includes two unreleased bonus instrumentals. On our Hip-Hop sublabel Audiac Records we released a couple of mixtapes between 2004 and 2007 by DJ Scientist, DJ Arok, Phonatic and the Dedicated Beatheads – all of them are now available via Mixcloud. So check them out and repost if you like them! Greetings and welcome to Random News #11. First, we’d like announce a new release by our long-time friend and label’s artist, David Vangel! The album is entitled “BNAPTH” and it is an astonishing 4 track – jazz fused – instrumental hip-hop release which follows the successes of his moodier releases with Equinox Records. This new release comes as a Digital Download as well as a limited edition floppy-like CD version and is Out Now on Toronto based 5&1/4 records. Staying with “BNAPTH”, here is the first official video of the release for the track “DumDum”, shot, directed, & edited by Primitive Replica. Also, Scattered Vinyl was quick to respond with a fine review on “BNAPTH”, giving the release a fine rate of 8 out of 10! 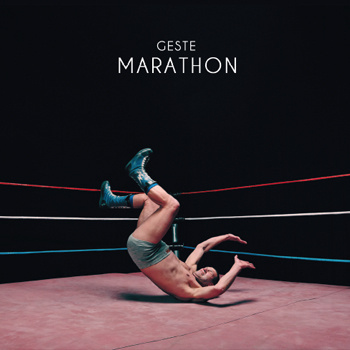 Switching to Geste and his band’s new release entitled “Marathon“. Released on both, limited Vinyl and limited CD, this 5-track album release brings forth the “electric” side of one of our label’s most characteristic and unique producers. The release also includes a new version of “Jaw Breaker” which was the title track of Geste‘s first release on Equinox Records. The 12″ version of “Marathon” is limited to 250 pcs and is out on Fin de Siècle. The CD version is also limited and only on 200 pcs and is released by Geste, FFR & CR. “Marathon” was first aired (premiered) on The Drone Magazine. Moving on to Godblesscomuters‘ “Romania” Official Video which is featured on Motion Graphics‘ website, alongside some amazing screen-shots from the video. For all of you who can’t read German, please go to the Google Translated version of the page by clicking HERE. Last but not least, for those of you who haven’t yet noticed, our online shop has a massive price-drop for the majority of our items. To go to the shop, click HERE. Since today, the “Freedom Is Remixed” EP by Godblesscomputers on our sublabel Equinox.Digital is available via download stores worldwide. For the remixes we have invited the special guests 813 from Russia, who created a stunning new version of “Nowhere”, and Anthony Drawn of Sichtexot Records,who made a great remix of “Fire Extinguisher”. Furthermore, the bouncing remixes by B-Ju and Digi G’Alessio, which have been available previously, are added one more time with a new master. Last but not least, we have a very special exclusive track by Gbc himself called “Feel Sick”, as well as the original of “Green Flowers”. Alltogether, a well rounded, beautiful new release. 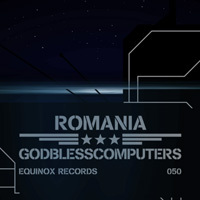 Today, we proudly want to announce the exclusive pre-release of Godblesscomputers‘ brand new EP via the US based digital store Addictech.com. 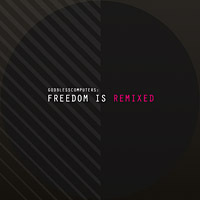 We first worked together with Addictech during the release of the two EPs by Kraddy - and as most new versions on “Freedom Is Remixed” are very club-friendly we have arranged a special deal with them again. For one week the release is only available through them, all other stores will have it available one week later, on September 27th. For “Freedom Is Remixed” we have invited special guests such as 813 from Russia (who just turned heads with his amazing rework for the Sweatson Klank contest!) who remixed “Nowhere” and Anthony Drawn of Sichtexot Records who created a beautiful new version of “Fire Extinguisher”. Furthermore, the bouncing remixes by B-Ju and Digi G’Allesio are added one more time with a new master. They had originally been released on the digital version of Godblesscomputers first EP as “bonus tracks” – but we thought they would deserve even more attention as they are definitely top notch! Last but not least, we have a very special exclusive track by Godblesscomputers himself called “Feel Sick”, as well as the original of “Green Flowers”. Alltogether, a well rounded, beautiful new release which works as a perfect addendum to his previous EP. However, I now want to share some background info about my work with Ceschi. This is how the trials have affected our way of making music and were the main reason that our second album, which we had planned for 2011 was never released, or basically how the creative and productive period from 2007 to 2010 had come to an end. 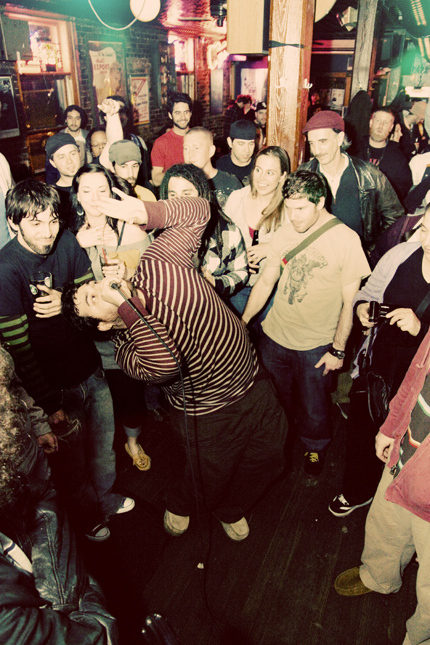 I mainly got to know Ceschi’s music through Noah23, who gave me a demo of his first album (“Fake Flowers”), while Noah and I were on tour together in early 2005. I immediately loved his way of rapping, singing as well as his very unique voice. If I remember correctly, I then contacted him through his website and, as he liked my beats, we had loosely been in touch via emails and myspace from then on. 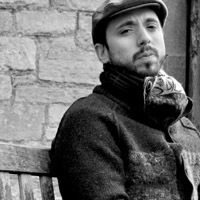 A major step in our cooperation was when I asked Ceschi to come to Europe and join the first Equinox Tour in 2007, which was his first time to perform in France, Switzerland and many other countries. All those that have witnessed the shows from this first tour know that he blew everything away in terms of his incredible shows and energy on stage. Since then – a great musical cooperation started – a cooperation which felt like a blessing to me because at that time I was kind of stuck with my own solo instrumental music and Ceschi made perfect sense to my beats. 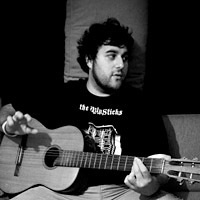 I did not really work with vocalists of rappers yet – Ceschi however, shared the same vision of Hip-Hop with me. The first beat that I particularly made for Ceschi, but not the first one he recorded, became the track “Count On It”, later released on a 7inch single in 2008. That beat was made still before we met on the Equinox tour. After the tour, when he still had a free day before his flight would bring him back to the states, he stayed at my flat in Berlin and we sat down in front of my computer, listening to some unused older beats on my hard drive. One beat that we listened to immediately caught his attention, it then became the song “The One Man Band Broke Up” – and was the first song he actually recorded the vocals for in his home studio in New Heaven. When I received the acapella, I still remember being so hyped to hear his voice over my beat that I immediately started to work on various remixes of that track the same night – the best of these remixes was released on the eqx-025 project later. Anyway, that song was very important because it basically was the beginning of Ceschi’s story about a fictitious character, Julius the Bearded Saviour, the main figure on our first full length album in 2010 which had the same name. 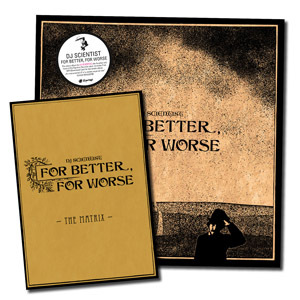 Before the album, we had also released another the singles, “Count On It / Bad Jokes”, “Same Old Love Song / Objects are Falling” (that featured 2Mex, Awol One, and Myka 9), as well as a very collectable postcard set. 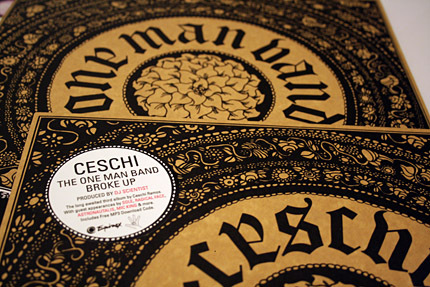 I believe that the “The One Man Band Broke Up” LP was kind of like a turning point for Ceschi’s as well as my career – at least out of my perspective on the European market. Even though Ceschi already had two albums out at that time, he was still quite unknown. But when the album was released to the public you could really feel the attention that it brought. However, December 6th, 2010 when Ceschi was caught by the police, it changed everything of course. For the first few days, after I had seen the crazy stories on the news, I wasn’t even sure if Ceschi – most importantly a friend of mine – would ever be free again, if I would be able to ever meet or talk to him again. Even though he was out on bail soon after, things weren’t the same anymore. From then on, Ceschi went through the most difficult period of his life, and still does. Unfortunately, we didn’t communicate as much as before anymore, Ceschi had to take care of keeping his label running, and basically had to tour even more than before to gain money for being able to pay his lawyers. His answers to my emails have always been short since then and although we spoke about continuing working on our music many times, we never really got back to it. Nevertheless, Ceschi recorded quite a lot of features around that time, worked on stuff together with Factor from Canada, but sadly we never found a proper way back to finishing our second album. In 2011 we still released our last cooperation, the “Shorted Circuits EP” which was already scheduled before Ceschi was caught by the police, and which had mainly been recorded in 2009. The title track of that EP was dedicated to his grandmother, who had unfortunately passed away. I believe that this is one of the most personal songs in rap history. From then on, the work split and whilst also focussing on my own label, I was finishing some of my older instrumental works, which resulted in my releases “The Artless Cuckoo” as well as my unreleased album “For Better, For Worse” in 2012. However, we never lost touch completely and have been emailing every now and then about the music. Ceschi recorded a few new things for the album while I was preparing a some beats – but everything felt really slow, compared to our earlier work together. Meanwhile, the vision of our album shifted and as we didn’t make that many new songs, we decided that our next full length would rather be a compilation of unreleased older and some new material, mixed with tracks from our previous singles. This album is 90% finished, including a final tracklist and name – only one more new song needed to be recorded, and for another song a second verse had to be made. Unfortunately, Ceschi could not finish writing the lyrics and record them before he went to jail, so I could finalize the music for it. Hence, this album will wait to be released once he is back from prison. I have spoken to Ceschi via Skype a few weeks ago and I was happy that he seemed still optimistic about the future, looking forward to a lot of projects as soon as he would be free again. To me, he almost seemed relieved that the trials had come to an end – even with the bad outcome for him. The purpose of why I am writing this is mainly to give fans an update about what has happened and how the legal things have affected our musical cooperation. Our second album will definitely be released one day and we also agreed to start a totally new and different project in the future. I hope that we will be able to make music again and a new creative period for us will arise when he is free. Here are some words from Ceschi’s last email to me: “I think I’ll be heavily inspired with this time in prison. I’ll be writing consistently and will be more focused than ever. It could lead to better music in the end.” So I think I should get back to making some beats for him. Even though I am not directly affiliated with his label and I don’t have much contact with anyone else on Fake Four, I know how important the label is for Ceschi and how much it means to him. Therefore, please show support and grab a few goodies from their offers (see link on top or below)! From my end, I also want to announce that, as the vinyl of “The One Man Band Broke Up” is basically sold out, we will repress a couple of more “to keep the legacy alive”. All his other releases on Equinox were limited editions and won’t be repressed – grab them while you still can! Additionally, there is one unheard and exclusive Ceschi song that I produced which I will be able to share with you soon. It will be a free single from our new Ceschi & The Raincoatman bandcamp account which we had planned to create. 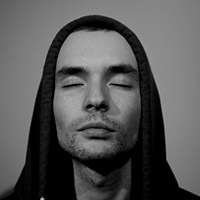 I also want to share another track with you soon, but I still have to arrange that with other people who are involved. 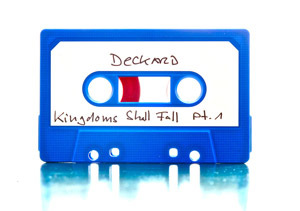 Strictly Kev aka DJ Food has been a strong supporter of our label in the past years and it’s been an honour being featured on his blog a couple of times. He was quite surprised about the closure of Equinox Records and therefore he wrote some nice words and added a few beautiful pictures of the Counter Future release. Reacting to our label’s closure, two of our main artists have written and published some nice words about their collaboration with Equinox Records. Today, I would like to announce that Equinox Records is closing. 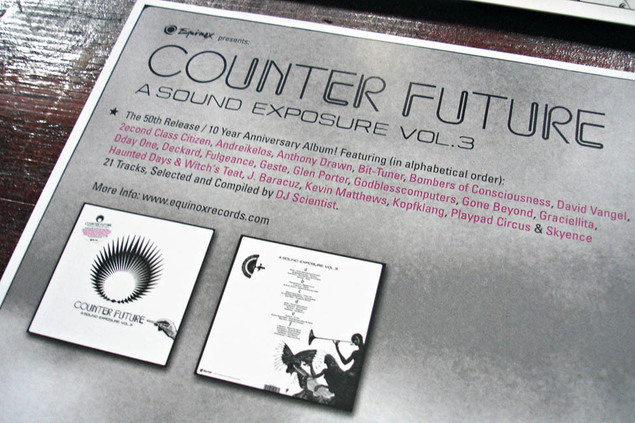 The “Counter Future – A Sound Exposure Vol. 3” album, the 50th vinyl release on the label, marks the final item. This announcement takes a load off my mind as this has not been a spontaneous move. The closure has been a decision made in late 2011. At that time it almost seemed impossible as the label has been my life – today, it has proved to be the right step. There are multiple reasons for the closure. First of all, as founder, father and head of the label, new goals have developed for my life. Unfortunately, this announcement was meant to be kept secret until now. Only a small bunch of near friends and our main artists have been informed in advance. I have risked a lot for the label and also denied myself of many things. But Equinox Records has simply been a project from the heart. I have experienced a lot of positive things with the label in the past years – and many of my dreams have become true. With unique and individual artists it has been a musical celebration, a big picture with countless nuances, styles and colours. Even in the past years, the development of the label still seemed to be on track, despite the ubiquitous negative trend in the music business. I have always been sure that our music will reach a wider audience sooner or later. Nevertheless, there has never been a breakthrough for Equinox and I can say for sure that some of our artists would have deserved more attention. However, I faced the fact that the main goals that I had when I started the label have been reached and that they don’t necessarily have to be measured with plays and hits. Equinox has built up a small world on its own. As I have been involved in the artistic process of most releases, the extensive label catalogue is something that I am extremely proud of personally. Anyway, I am still a bit sad about the fact that Equinox has always been some kind of outsider: many times the music has been regarded as somewhere in “between”, sometimes as too experimental or as too different. The label has always been confronted with lack of understanding, especially in terms of press and distributions. Though this is something that countless other labels are experiencing as well. Nevertheless, the actual market-based conditions in the music business have been another essential problem for myself. Even though music in the electronic field can technically be produced with almost no costs, it needs a lot of money to finance the product, to promote and market it, and many other things. Therefore, the extensive label work had to be done with a lack of means. I had to face the fact that I am partly running an exhausting DIY business. In the end, I had to ask myself if I want to continue with the label work, and possibly add another 10 years of running the company, and the answer was a clear “no”. With the final „Counter Future“ project I wanted to define and demonstrate one more time what Equinox is. I am very content with the compilation and happy that almost all artists, that have accompanied the label over the past years, are part of it. “Counter Future” completes the picture that I have talked about earlier. The album closes some kind of circle, back to the first release. I am writing all this with a tear in my eye, because an important period in my life ends. I have to thank those who have helped me along the way: all artists, my family, friends and fans. I especially want to thank Dimitris Kountouris for the extensive help in 2012 as the second label manager and talented engineer. Without him and his support I probably wouldn’t have been able to release about 15 releases the last year. Almost our complete catalogue will be available today as a free download via Bandcamp for 24 hours. 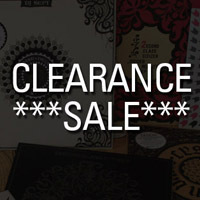 Additionally, we have lowered the prices for many of our items in our shop. These can be ordered directly via Bandcamp though it is better (and cheaper) to buy directly via the Equinox Online Store. Furthermore, I would like to announce that there will be one more final release on the sublabel Equinox.Digital by Godblesscomputers. Afterwards this label will be closed as well. However, the company around Equinox will still be active and our website and shop will still be run. Additionally, we will try to keep you updated as much as we can about news from our former artists and more. We recommend following us on Facebook and/or subscribing the newsletter. heute ist es an der Zeit, die Schließung von Equinox Records bekanntzugeben. 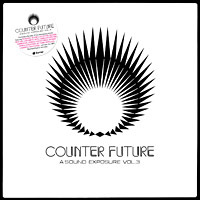 Das „Counter Future – A Sound Exposure Vol. 3” Album, unsere 50ste Vinylveröffentlichung, stellt somit das letzte Release dar. Damit fällt mir ein Stein vom Herzen. Denn dies ist kein spontaner Entschluss, sondern eine Entscheidung, die ich bereits Ende 2011 getroffen habe. Damals schien es unmöglich, denn das Label war mein Leben – heute hat es sich als konsequent und richtig für mich erwiesen, diesen Schritt zu gehen. Gründe für die Schließung gibt es viele. In erster Linie haben sich für mich als Gründer, Vater und Macher des Labels neue Ziele für mein Leben entwickelt. Leider war es wichtig das Ende bis jetzt geheimzuhalten. Nur ein kleiner Kreis von Vertrauten und unsere Stammkünstler waren bereits vorab informiert, da sich auch für sie die Zukunft neu gestalten wird. Für das Label habe ich vieles riskiert und auch auf sehr viel verzichtet. Aber Equinox Records war eben ein Herzensprojekt. Mit dem Label habe ich die letzten Jahre viel erlebt – es konnten viele meiner Träume verwirklicht werden. Anhand einzigartiger, individueller Künstler war es ein musikalisches Fest, ein großes Bild mit zahlreichen Nuancen, Stilen und Farben. Auch noch die letzten Jahre schien alles für mich, trotz vieler epochaler und nicht unbedingt positiver Entwicklungen am Musikmarkt, ständig bergauf zu gehen. Ich war mir sicher, dass die Musik früher oder später auch eine etwas größere Hörerschaft erreichen würde. Dennoch ist der große Durchbruch des Labels nie gelungen und sicher hätte manch einer unserer Künstler mehr Aufmerksamkeit verdient gehabt. Jedoch festigte sich in den letzten beiden Jahren bei mir die Einsicht, dass die wesentlichen Ziele bereits erreicht sind und man diese nicht unbedingt an Plays und Hits messen muss. Eine eigene kleine Welt wurde durch Equinox geschaffen. Und da ich selber viel in den künstlerischen Prozess eingebunden war, so ist der reichhaltige Katalog ein Nachlass, auf den ich persönlich auch sehr stolz bin. Ein wenig traurig stimmt mich aber noch heute, dass Equinox doch irgendwie immer eine Art Außenseiter war: Die Musik galt mal als irgendwo „dazwischen“, mal als zu experimentell oder zu anders. Teilweise stand dem Label großes Unverständnis und Kopfschütteln gegenüber, insbesondere bei Presse und Vertrieben – durchaus aber ein Schicksal, mit dem andere Labels genauso zu kämpfen haben. Durch die aktuellen marktwirtschaftlichen Voraussetzten im Musikgeschäft entstand aber auch ein weiteres essentielles Problem für mich. Selbst wenn Musik im elektronischen Bereich technisch betrachtet fast kostenlos produziert werden kann, so braucht es neben der Finanzierung der Tonträger Geld für Marketing und viele andere Dinge. Die umfangreiche Labelarbeit musste daher eben mit den beschränkten Mitteln gemacht werden, die gerade zur Verfügung standen – und war deshalb auch viel DIY und dementsprechend anstrengend. Schließlich musste ich mir die Frage stellen, ob ich noch mal 10 Jahre Labelarbeit machen will und musste diese klar mit „nein“ beantworten. Mit dem abschließenden „Counter Future“ Projekt wollte ich noch mal aufzeigen, was Equinox ist. Ich bin sehr zufrieden mit der Zusammenstellung und froh, dass fast alle Künstler, die das Label über die Jahre begleiteten, darauf vertreten sind. „Counter Future“ vollendet das Bild, von dem ich anfangs sprach. Für mich schließt das Album einen Kreis, zurück bis zur ersten Veröffentlichung. Ich schreibe dies alles mit einer Träne in meinem Auge, denn eine wichtige Zeit in meinem Leben geht zu Ende und ich bin denen zu Dank verpflichtet, die mich auf diesem Weg begleitet haben: allen Künstlern, Helfern, meiner Familie, Freunden und Fans. Insbesondere möchte ich an dieser Stelle Dimitris Kountouris danken, der als zweiter Labelmanager und talentierter Engineer den Endspurt des Jahres 2012, in dem wir über 15 Veröffentlichungen hatten, erst möglich gemacht hat und der mir durch seine positive, leidenschaftliche Hilfe zum Label tatkräftige Unterstützung gab. Für 24 Stunden gibt es heute (fast) alle unsere Veröffentlichung als kostenlosen Download über Bandcamp zu beziehen. Zudem haben wir sehr viele Artikel in unserem Shop reduziert. Diese können direkt über Bandcamp geordert werden, besser sind jedoch Direktbestellungen über den Equinox Online Store. Auf unserem Sublabel Equinox.Digital wird Ende September noch die „Freedom Is Remixed“ EP von Godblesscomputers veröffentlicht, danach wird dieses Label ebenfalls eingestellt. 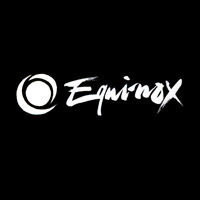 Die Firma um Equinox wird aber weiterhin aktiv sein, die Website und der Equinox Online Shop werden weiterlaufen. Auch werden wir weiter versuchen euch über Neuigkeiten zu unseren Artists zu informieren. Folgt uns diesbezüglich über Facebook oder abonniert den Newsletter. 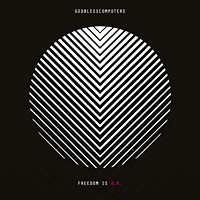 After his successful “Freedom Is OK” EP release on Equinox Records a few months ago, Godblesscomputers returns with “Freedom Is Remixed” EP, which will drop on September 27th on our sub-label Equinox.Digital. On this release, we have invited special guests such as 813 from Russia (who just turned heads with his amazing rework for the Sweatson Klank contest!) who remixed “Nowhere” and Anthony Drawn of Sichtexot Records who created a beautiful new version of “Fire Extinguisher”. Furthermore, the bouncing remixes by B-Ju and Digi G’Allesio are added one more time with a new master. They had originally been released on the digital version of Godblesscomputers first EP as “bonus tracks” – but we thought they would deserve even more attention as they are definitely top notch! Last but not least, we have a very special exclusive track by Gbc himself called “Feel Sick”, as well as the original of “Green Flowers”. Alltogether, a well rounded, beautiful new release which works as a perfect addendum to his previous EP.